One of the most challenging, but ultimately the main goal, of organic chemistry is to take an abundant, cheap starting reactants and transform it into a biologically active or synthetically useful product. In the two semesters of organic chemistry, you will learn reactions that will produce all of the functional groups that give molecules these useful properties. But as a chemist, it is very importantly to accurately predict how and in what yield these reactions will produce you desired products. The stakes seem higher when you are given less than 2 hours to complete several multi-step synthesis problems that often ask to identify not only reagents but the mechanism of each step of the reaction. We here at StudyOrgo have compiled advice and guidance for learning to tackle these problems. Change in the carbon-carbon skeleton: Take a look at the starting material and the final product. Count the carbons, is there a difference in number? If so, then you will need a carbon-carbon bond breaking or addition reaction. There are only a few examples of these reactions so that instantly narrows down reactions you have to focus on. Change in the identity or location of a functional group: This is the most common synthesis question. Remember, that the pathways from one functional group to another are limited. Set up a reaction roadmap or use included with your StudyOrgo membership to help you memorize what reactions can be used to get you to your final functional group. There are often times MANY routes to get to a final product. ALL OF THEM ARE CORRECT, if in fact the route is possible. HINT: Professors will only ask you to use reactions they have covered in class. Make a list and indicate what the reaction does to help you memorize the products. Sound out the problem. Often time students have a viable synthesis approach, but get held up at one or two places and just leave the entire question blank. Remember, it is multistep, which means there are many places to get points! Draw out what you know. Worst-case scenario: you get partial credit. Best case scenario: you realize what reaction is next and get full points!! Practice, practice, practice! Make sure to perform all of your practice problems assigned to you for each chapter. It takes a lot of time and effort, but likely these examples will be used by your professor. Also, the more examples you see the less surprises will be on the exam! 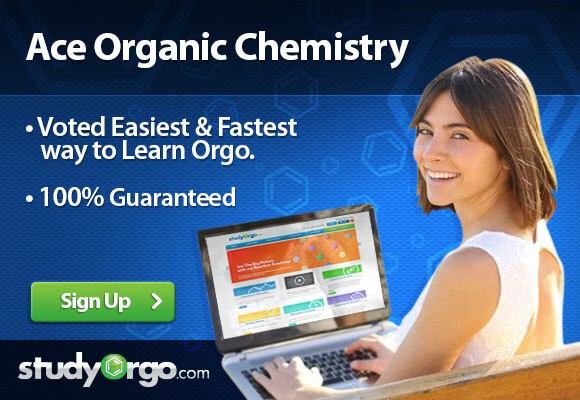 Sign up with StudyOrgo for help! The Editors at StudyOrgo have spent numerous hours reviewing and preparing the material in the most crystal-clear and “get-to-the-point” manner as possible. We provide quick descriptions and in-depth mechanism explanations. Many of our reaction have multiple examples, so you can learn and then quiz yourself in our website! For the student on-the-go, we have also developed a mobile app (iOS and Android) provides all the functionality of the website! All of these benefits are included in your StudyOrgo membership!